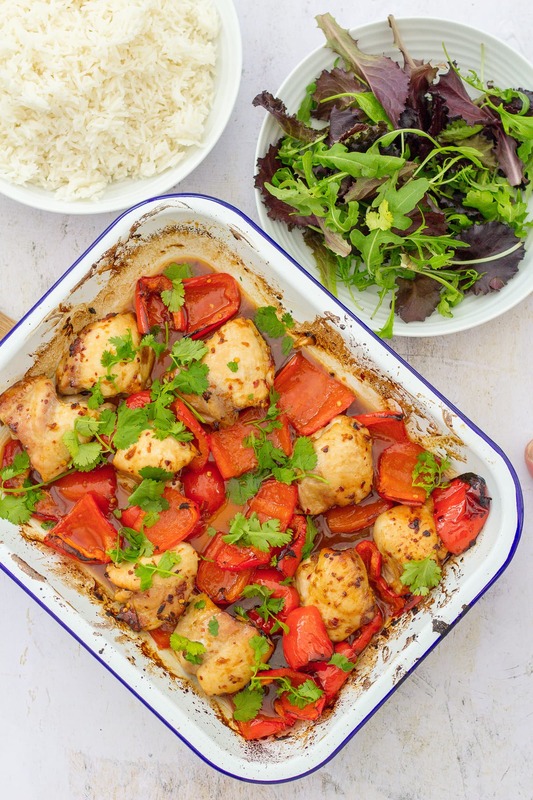 This quick and easy Sticky Chicken Traybake is inspired by a Mary Berry recipe: chicken thighs are coated in a delicious mixture of soy sauce, honey, ginger, chilli and sesame oil and roasted in the oven. Delicious served with jasmine rice and roasted red peppers. Who’s your foodie hero? I have quite a few: Jamie Oliver, Nigella Lawson, Hugh Fearnley-Whittingstall and Rick Stein are all up there, but one of my all-time foodie heroes has got to be Mary Berry. I love her style of no nonsense, family friendly but flavourful cooking. In fact so much that I reviewed my favourite recipe book of hers, Mary Berry’s Absolute Favourites, here on this blog a few years back. One of the standout recipes from that book was Mary Berry’s sticky chicken. 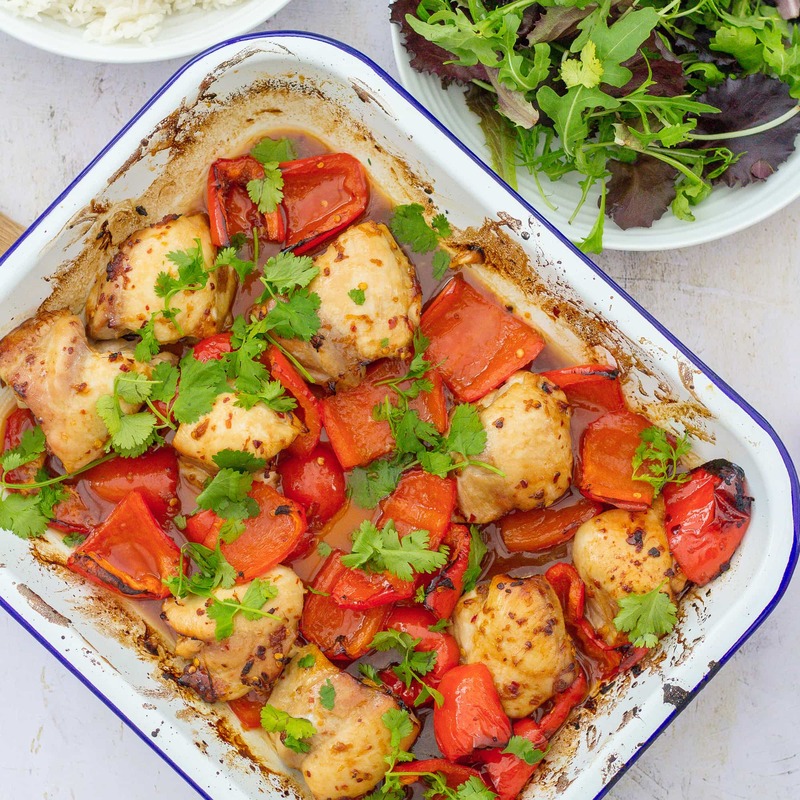 Mary coats her chicken in sesame oil, soy sauce, ginger, chilli and honey and roasts it in the oven alongside red peppers for a quick and easy weeknight dinner. My version of Mary’s brilliant recipe is very similar, but I’ve made a few adaptations. Firstly, I’ve swapped Mary’s suggestion of chicken breasts for skinless, boneless chicken thighs, which I think are better suited to the traybake treatment (I find breasts can dry out too much when roasted like this). Thirdly, I didn’t bother reducing down the glaze in a saucepan after the chicken comes out of the oven – way too much faff for a busy weeknight, and the sticky glaze is delicious just as it is. I’ve also swapped Mary’s suggestion of serving with parsley with fresh coriander, which I much prefer with the flavours of soy sauce, ginger, sesame etc. And finally I have chosen to serve this easy chicken dish with rice rather than wedges, as Mary suggests. 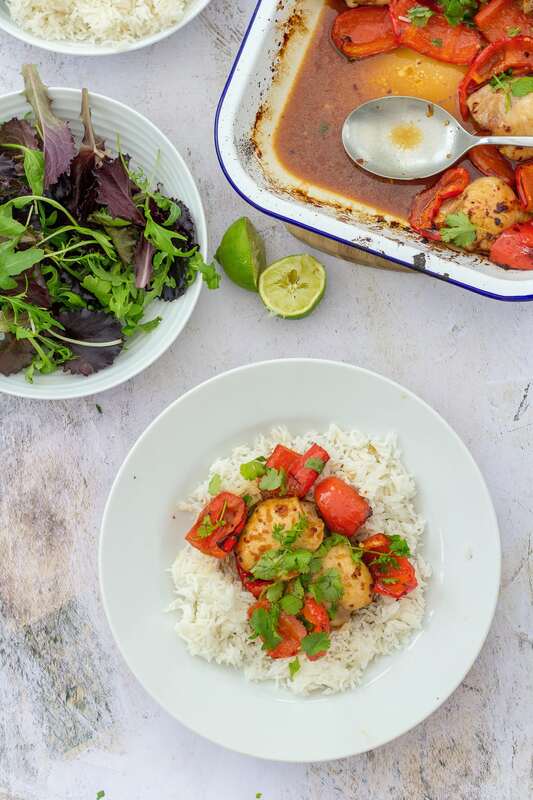 This dish is quite Asian in flavour and so to me, rice just seems like the perfect thing to serve it with – and the rice tastes amazing covered in that lovely sticky glaze. But other than that it’s Mary Berry’s Recipe!! Not only is this Sticky Chicken Traybake delicious straight out of the oven, it is also AWESOME the next day as a packed lunch. My husband was chuffed to bits with his! Speaking of which, my hubby has finally decided to join Instagram – whoop whoop! He has started an account charting the highs and lows of being married to a food blogger – it’s called @anothercolddinner of course! If you want to see the other side of what I do: all the outtakes and what’s on the other side of the camera that you can’t normally see, do head over and give Mr G a follow!! 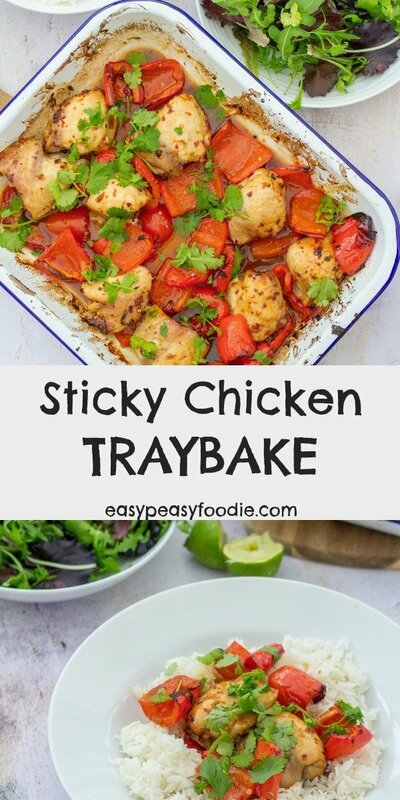 Wine wise I would definitely serve this Sticky Chicken Traybake with a dry or, even better, off-dry Riesling! This kind of food was made for Riesling! Other good options include other aromatic whites such as Pinot Gris/Pinot Grigio, Austrian Grüner Veltliner and Argentinian Torrontes. If it must be red, then try Beaujolais or a light Pinot Noir. A fruity rosé would also work well here. If you are a fan of quick and easy chicken traybakes, there are plenty more over in my traybakes section. Preheat the oven 220C / 200C fan / gas mark 7 / 425F. 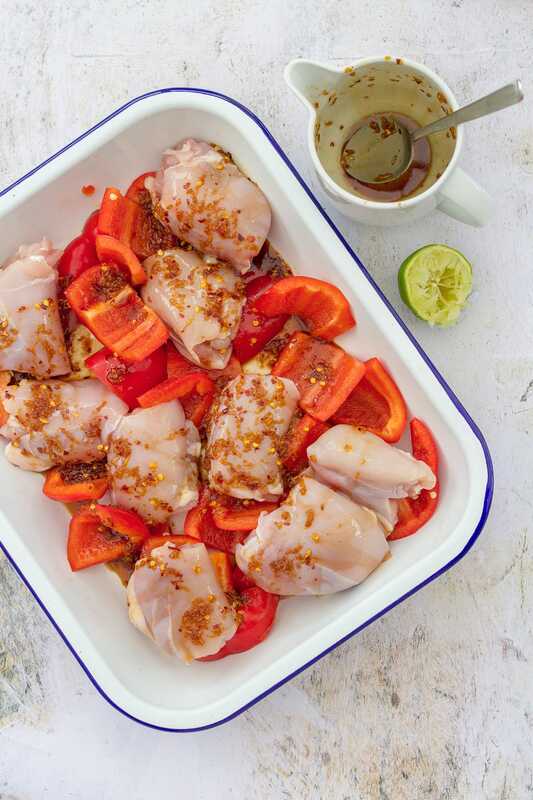 Place the chicken thigh fillets and chopped peppers in a large oven tray. Mix together the soy sauce, sesame oil, honey, lime juice, ginger, chilli flakes and salt in a small jug or jam jar. Pour the glaze over the chicken and peppers and turn to coat. Spread out the chicken and peppers into a single layer. Place the chicken and peppers in the preheated oven and cook for 30 minutes. Baste halfway through cooking. After 30 minutes, remove from the oven and sprinkle with the coriander. 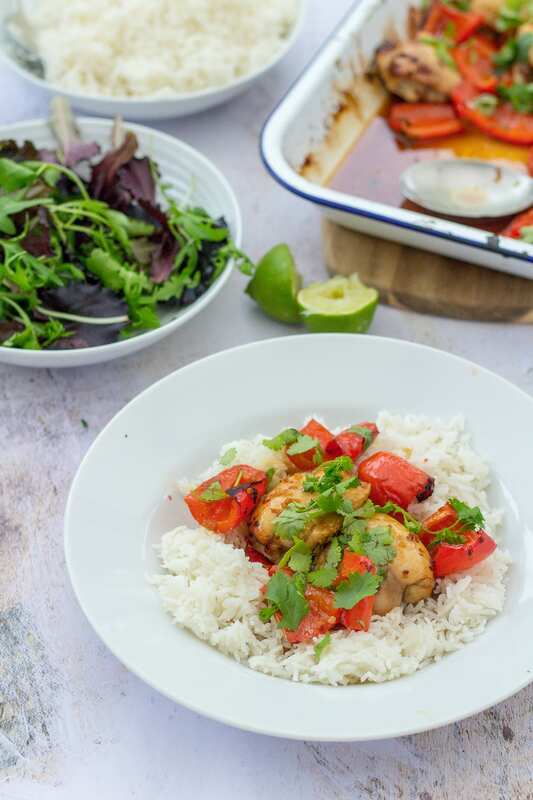 Serve with rice and lime wedges. Love Mary (a true old-fashioned Home Economist) and her no nonsense approach to food. I think I may have made this recipe before I sem to recall the boiling down glaze. But like you I no doubt would have adapted it Lets face it we just cant help ourselves. Love the support from MR G I’m sure a lot of otherhalves will identify with him. Im off o give him a follow and will get Mr B to follow too. This looks absolutely delicious! I love Mary Berry recipes too and you’ve definitely made this one your own. I’ve also had a quick look and followed Mr G. If Mr SearchingforSpice was on Insta I’m sure he’d identify! Thanks for sharing with #CookOnceEatTwice – those leftovers on Mr G’s feed looked yummy! Love tray bakes, love this. 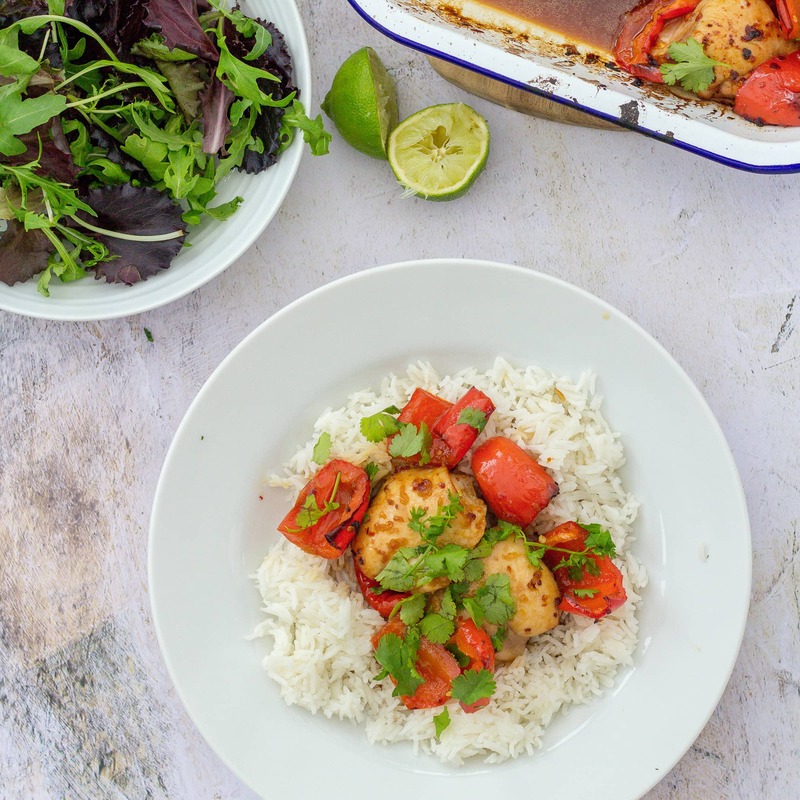 Simple yet delicious and nutritious too….I know what I’m making tomorrow kiddies! Another day…. another delicious tray bake! Yummy…. I’m on my way…. I’m giving you a mental cursty, oh Traybake Queen! What a beautiful dish! I don’t think I’d be able to concentrate for the first half of the day at work if I knew that THESE leftovers were waiting for me in the fridge! Made this tonight, it was really tasty and easy to do, I served my chicken with sauté potatoes it made a lovely meal. I think I will double up on the sauce quantities next time as it was lovely, I used frozen peppers that’s all I had as this was a spur of the moment decision to make it. It will be on my menu from now on. Thank you.